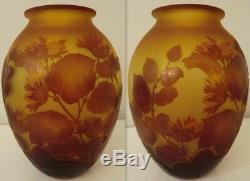 1900 French Art Nouveau GALLE cameo glass Vase. 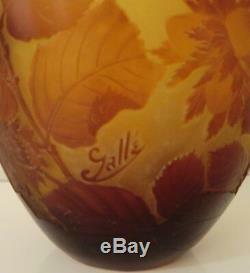 Galle was a designer who made glass, pottery, furniture, and other Art Nouveau items. Emile Galle founded his factory in France in 1874. Galle developed a marquetry process that involved embedding pieces of colored glass in the body of a large piece of glass to create a design. The name Galle was used as a mark, but it was often hidden in the design of the object. After Galle's death in 1904, the firm continued to make glass and furniture until 1931 28 cm H x 8 cm D in the center 11 " H x 3 1/4 " D in the center. Acid-etched with Hazelnut Brown color Signed in cameo Gallé In excellent condition. We use professional packing materials, such as plenty of bubble wrap and polystyrene popcorn. In general, all sales are final. The item description and images represent this item to our best ability to provide accurate and complete information. Thank you for your interest. The item "1900 French Art Nouveau GALLE cameo glass Vase" is in sale since Sunday, February 11, 2018. This item is in the category "Pottery & Glass\Glass\Art Glass\French\Other French Art Glass". The seller is "libraco" and is located in Gockhausen. This item can be shipped worldwide.